Friends and enemies alike focused almost exclusively on Governor Palin’s hands this past week, following the apparent use of “crib notes” inked in her left palm. A recent report indicates that these inscriptions were not crib notes at all. They were most probably a carefully crafted sleight of hand. A bulb just switched on at HuffPo, thanks to Joan Williams (Riddick, 2010, ¶1). Williams is an out and out Obama supporter but she deserves a tip of the hat because, though not sharing Governor Palin’s politics she has considerable respect for her as a politician (Riddick, 2010, ¶2). Addressing the Tea Party, Sarah Palin wrote three notes on her hand: “Energy, Taxes, Lift American Spirits.” Why? She already had notes in front of her on the podium. Surely she could remember three simple themes. Why write notes on her hand? Here’s my take on why: she knew that they would be visible when she gave the speech. And she knew that she would be made fun of — as so stupid that she needs to write notes on her hand. And that’s one of her most effective tactics — to be made fun of. It’s an integral part of her strategy of standing in for hardworking, Middle Americans, derided by the condescending, know-it-all liberal elites. Thus the White House became a vehicle for Palin’s narrative of the snooty elites who think they’re better than average Americans. Palin is a brilliant strategist. First, note that I just repeated Palin’s key talking points: Palin has even us fellow travelers at The Huffington Post repeating, “Energy, Taxes, Lift American Spirits.” Talk about earned media. I was in the Forensics/Debate club at Holy Cross High School, and that was where I had my first experience with speech-writing and public speaking. I took a speech-making course at St. John’s University for my Bachelor’s Degree. Prior to getting involved with Governor Palin, I spent my political time advocating for the Twin Towers to be rebuilt. As part of that advocacy, I would speak at Lower Manhattan Development Corporation (LMDC) hearings. My speech notes were written in Arial 14 pt., all lower case, double-spaced. When I was in Bethlehem, PA at Governor Palin’s rally on October 8, 2008, I was in a position to see her from behind the lectern and saw her notes. They were same format as mine. All the speakers in fact, used this format. 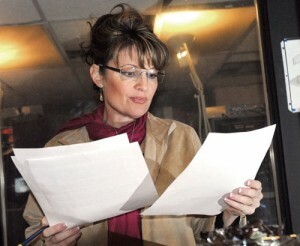 This photo shows Governor Palin practicing for her 2009 State of the State Address, which she did from notes. Governor Palin is old school…. As Riddick pointed out — Williams, an Obama supporter — stated that Governor Palin had her notes; those notes were visible on the lectern; she moved her hand in such as way as to make her writing upon it more visible — the writing on her hand was not to aid in her speech. It was to make a point. 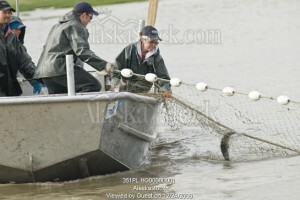 If you think a 5’6″ woman gill-netting thousands of pounds of salmon is amazing, since the focus of this discussion is on hands, try doing that work with a broken hand — the day after you broke it. Governor Palin did precisely that (Hilley, 2008, p. 72) as an employee on her husband’s fishing boat, as documented in Sarah Palin: A New Kind of Leader. Her hands know hard labor, and she has the broken bones to prove it…. 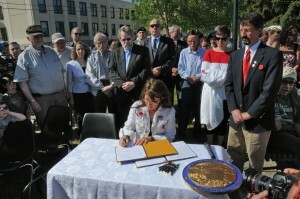 As Governor, her hand very often signed bills into law…. Her hands elevated soldiers’ ranks…. Her hands bond with ours…I was fortunate to have three such bonds, two of which occurred in a 38 minute period. No, that’s not my hand bonded with hers in the photo. (Photo Copyright © 2009 Shealah Craighead and SarahPAC). For a lucky few, the bond extends further…(Photo Copyright © 2009 Shealah Craighead and SarahPAC). Like the slogan says…and those are her hands holding and signing it…(Photo Copyright © 2009 Shealah Craighead and SarahPAC). Hilley, J. (2008). Sarah Palin: A New Kind of Leader. (Grand Rapids, MI: Zondervan).